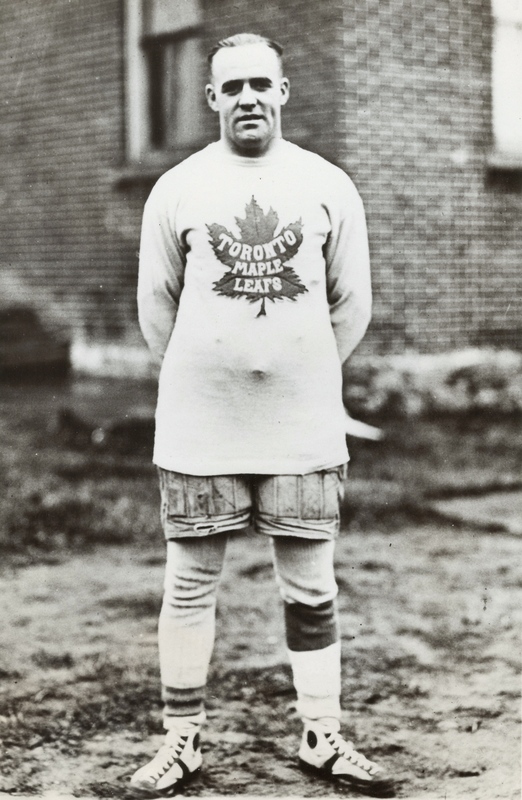 King Comes To Town: Clancy shows off his new Leaf togs at training camp in Parry Sound, Ontario, in October of 1930. Trade your skipper across the province to your bitterest cross-province rival? It happens, every once in a while, as Dion Phaneuf recalls. In October of 1930, Frank Clancy was captain of the Ottawa’s (original) Senators, one of the best players in the National Hockey League, when Toronto’s irrepressible Conn Smythe came calling with his chequebook. As today’s Leafs continue to prepare for the new season — they were skating in Halifax earlier this week, awaiting coach Mike Babcock to finish up with the World Cup — maybe would we revisit how it happened that the man they called King ended up donning the blue 86 years this fall? Answer: yes. Going into his tenth NHL season, Clancy was, by then, one of the NHL’s brightest stars. Montreal’s formidable Howie Morenz said he was the hardest defenceman to get around. Andy Lytle of The Vancouver Province watched him skate as a guest of the Vancouver Lions in April in a post-season exhibition versus Boston’s touring Bruins. 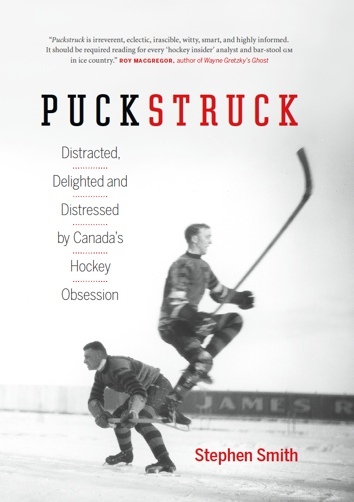 “Clancy is the greatest hockey player in the game today,” he pronounced, rating him “vastly superior” to Eddie Shore. There is no theatrical by-play to Clancy’s work. Once that whistle blows, he forgets the crowd and all else, except that there is ice under his feet, a puck to be followed, and that he possesses a pair of super strong legs, a hockey stick, an eagle eye, and a vision that functions every second. Frank Patrick was alleged to have said he was in a class by himself. Even the Bruins concurred, inviting to join them as they barnstormed down to California. The New York Rangers had tried to buy him during the 1929-30 season. And even as Clancy kicked up his skates on the west coast, the rumour simmering back on the east was that Montreal Maroons were in with an offer. Clancy’s contract was expiring: that was the thing. Plus (the other thing): the Senators were in a rocky financial straits. By August, Clancy’s availability was front-page news in the capital. Clancy’s price was high. Maroons were said to be willing to offer $40,000. The season started in November in those years, and as fall came on, the Bruins were said to be in the mix too. And Toronto. Leafs supremo Conn Smythe was desperate to improve his team. The team he’d bought and transformed in 1927 had yet to raise a Stanley Cup, and it was coming on ten years since the old St. Patricks had done it. Smythe’s problem as a shopper was that his board of governors was only willing to spend up to $25,000. Another potential hitch: Clancy was said to have vowed that Toronto was the one team he’d never play for. Smythe wasn’t a man easily fazed. First, in September, he went to the races. He owned an underperforming filly, Rare Jewel, that he’d entered in the first race of the season at Toronto’s Woodbine racetrack, the Coronation Stakes, where the rank outsider won. Smythe’s take on the day was more than $14,000. As Smythe tells it in his 1981 memoir, he had one thought as he collected his winnings: Now we can buy Clancy. Now we are going to win the Stanley Cup. Next: he sent his assistant manager, Frank Selke, to Ottawa to ask Clancy about playing for the Leafs. Love to, Clancy said, if you pay me $10,000. For the defenceman, it was a simple enough calculation. As he writes in Clancy (1997), the memoir he wrote with Brian McFarlane, his Senators salary paid $7,200 with a $500 bonus for serving as captain. He had a full-time job at the Customs Department and that paid $1,800, which brought his annual earnings up to $9,500 a year. Smythe told him that he could only pay him $8,500 — but that if the Leafs had “any kind of year at all,” he’d add a bonus of $1,500. As he considered the deal, Smythe sought other counsel, too — via prominent ads in Toronto newspapers, he polled everybody in town: what do you think? Fans answered, by telephone, telegram, they dropped by in person at Arena Gardens on Mutual Street, where more than 2,000 letters also showed up. The consensus? Go get Clancy. To secure Clancy, the Leafs sent $35,000 plus two players to Ottawa, defenceman Art Smith along with a forward, Eric Pettinger. Andy Blair was originally part of the deal, but Ottawa wanted a defenceman, so they got Smith. Smythe paid $10,000 down, the rest with post-dated cheques. The Ottawa Journal wondered: will you be the best-paid player in the NHL? His prodigies of valor and his keen sense of the dramatic will make him a star in any company. Swift and sure on his skates, powerful in defence and all but invincible in attack, possessed of a shrewd insight the opponent’s plan of campaign, Clancy carries on the highest traditions of a long succession of notable players who have risen from the amateur ranks in Ottawa to pack the rinks and delight the crowds in cities across the continent. “I always think of it as the year the Leafs got Clancy,” Smythe recalled in that 1981 memoir of his. If You Can’t Beat ‘’Em in the Alley he called it; Scott Young was aboard as his writer. The purchase so pleased him that he went out and bought his wife a brand new Franklin Transcontinent Sedan. He didn’t have the cash for that either, but never mind: the Leafs were set. After two years in Port Elgin, the Leafs made a pre-season move in 1930, convening their training camp that year in Parry Sound, Ontario, the last two weeks of October. It wasn’t such an auspicious start: a group of ten players making their way north in their own cars from Toronto got stopped by a blizzard at Orillia, and had to continue by train. They all got there, though, eventually, checking in to the Kipling Hotel. Monday morning the drillmaster, Corporal Joe Coyne, led them out into the snow. The team was comfortable, and well-received by the community. A local jeweler loaned the players a radio, and when the weather cleared, a crew of them got out on the golf course: Busher Jackson and Charlie Conacher, Andy Blair, Harold Cotton Art Duncan, Benny Grant. Trainer Tim (a.k.a. Tommy) Daly went fishing with Lorne Chabot and Ace Bailey, returning with 21 “specimens.” Saturday night of the first week, the management of the Mansion House Hotel treated the visitors to a duck dinner. King Clancy arrived on the morning of the second Monday. He’d been granted a week’s leave to tie up his affairs in Ottawa. That included a goodbye visit to his former Senator teammates as they gathered at the Auditorium for coach Newsy Lalonde’s first practice of the year. Everybody was crying, The Ottawa Journal reported. “King made the rounds of the players and gave each and every one a cordial handclasp” — including Art Smith and Eric Pettinger, the players for whom he’d been exchanged. Last thing before he headed off to catch his train, Clancy presented trainer Eddie Gleason with a fountain pen. Now, in Parry Sound, he donned his Maple Leaf and looked ahead. His condition was good, a special dispatch in The Globe appraised, and he was more than ready to swing into action. When the season got underway in mid-November started with confidence, going undefeated in their first five games. Clancy didn’t quite get them a Cup that year — the following March, Toronto lost out in the playoff quarter-finals to Chicago. The year after that was better: in 1932, the team won its first Leafs’ Stanley Cup, beating the New York Rangers. Clancy’s old Senators were headed the other way, of course: further financial troubles saw them up and move to St. Louis in 1934.